There is a Toilet in the Shower!!! Everyday when I get home from school now, I discover something crazy. Like the toilet in the shower. I don't think I should use it. I better go upstairs. The sink is gone too. How am I going to wash my hands? Hmm...I don't remember seeing those pipes in the wall before. At least it looks like this toilet is still working. Good thing. This is what my room looked like when I left for school. I am a little sad because I know this is the last time it will look like this. And here it is when I got home from school. WHERE IS ALL MY STUFF??? I am really not happy about this. Here is the family room when I left for school. And here it is when I got home. What happened to the tile? Look at this dust. I am in shock. My mom is gonna blow a gasket when she sees this mess. So after I made the cake, I took my mom to Disney on Ice for her birthday. We do that every year. This time it was really special because it was High School Musical. We usually sit in the first row, so here I am in front of the ice. This shirt is really from the HSM Broadway Show, but I thought it was a good thing to wear. When we sit in the front row I have to wear my long underwear because it is so cold being next to the ice. I collect the program books. This is the 10th Disney on Ice show I have been too. I just love anything Disney. It started out with the basketball scene just like the movie. They were very good to play basketball and skate at the same time. Oh that is Gabriella and Troy. Well not really, but they made them look like it. My mom just loved Sharpay's car. They actually drove it on the ice. Oh yea, the kitchen scene. This is about when my mom's battery on her camera died, so we have no more pictures. Oh well. While me and my mom were having fun at the ice show, my dad and little brother were at home trying to get the water out of the bed. The construction guys are coming in the morning. My dad rented this neat little pump that helped get the water out. And my little brother kept walking back and forth to push the water toward the pump. it worked pretty good. Bye bye bed. I think my mom is going to cry because she loved her waterbed. But she was having a hard time getting out of it lately. A Message from Mom: Late January and early February 2008, will be forever etched in our memory. Sarah and I are going to begin a series that will highlight our amazing journey. As I wrote in our holiday newsletter this year, even I wouldn't believe the tales it it weren't for the photos. The story promises to be full of drama, danger, and lots of dust. A few miracles and even a pair of angels. The story really begins in November 2006. I was leisurely walking on Lane Avenue in Columbus when my cell phone rang. "Hello." "Mrs. Ely, it's Katie. It is sorta like raining in your family room..." But before we get to that chapter... let's fast forward to January 15, 2008. 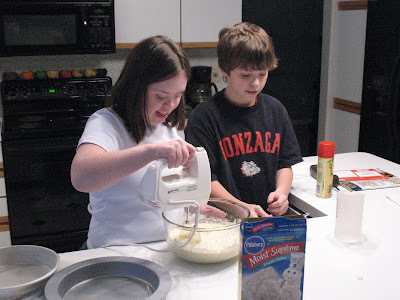 Sarah has been doing lots of cooking in school and now she wants to make me a cake for my birthday. We are in the midst of preparing the house for some minor construction to repair the leak that Katie encountered that November day. The last thing I needed was to take an evening to make an additional mess in the kitchen. So I tell her I appreciate the thought but I really don't need a cake. Matt the little charming brother says, "Mom, we can do it ourselves. I will help Sarah." I'm thinking, sure, famous last words, but give them the go ahead. I continue on with packing boxes and hauling them to the basement. A few minutes later, I look in the kitchen and stop dead in my tracks. 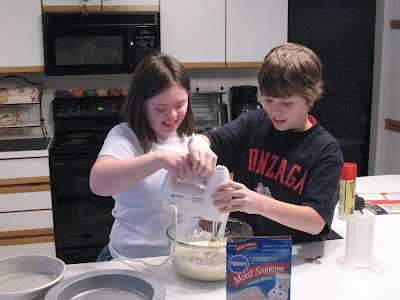 Sure enough, they are making a cake. 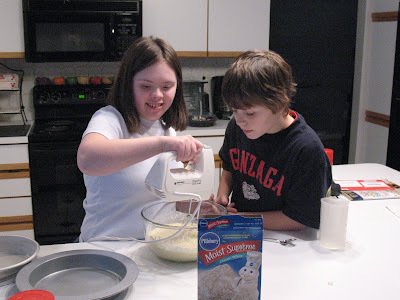 Matt has gathered all the ingredients and is letting Sarah do most of the work. How proud she is. And how proud I am of Matt. What a great little teacher he is being. When Sarah's arm starts to get tired from mixing, he doesn't take it from her and do it, he supports her. 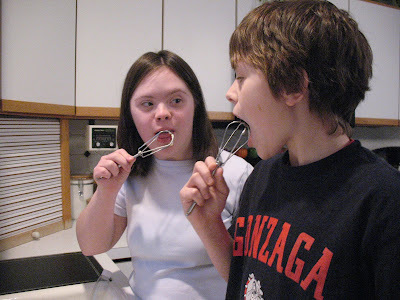 Sarah usually hates cake batter. 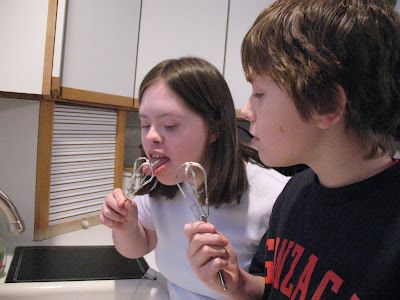 But Matt is licking the beater, so she is too. I can see in her eyes she is taking her cues directly from him. Here he is again. Not doing the job, but supporting her in learning to do the job. And now she is doing it herself, not perfect, yet he instinctively knows not to take over. If I was helping to make that cake, I would want the icing to be perfect. And that is not such a good teacher. I have now forgotten all about the packing project I was working on. I am busy watching this exchange between Matt and his sister. Chronologically she is 18, he is 11. Sarah has always been in his life. She was seven when he was born. She didn't spend as many nights at this age in the hospital as she had in her earlier years, but enough that he knows what it is like to be displaced and forgotten at times. He could be resentful. 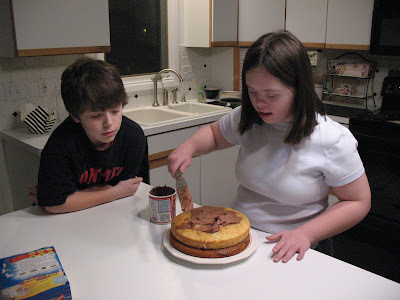 He could be miserably put out that he has to help his teenage sister make a cake. But instead, he is guiding with strong hands and nurturing with wisdom well beyond his years. 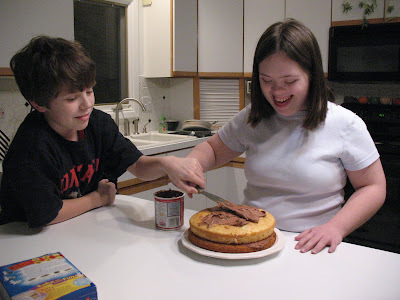 Teaching his mother that perfect isn't in the spread of the icing, but rather perfect comes from unconditional love within the heart. Yes, this will be the most perfect birthday cake ever. Now, that's my boy. 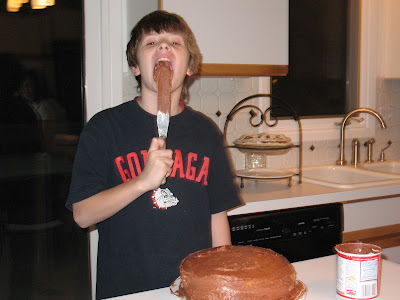 Licking the icing. Chocolate icing. They know me well. How did he get her to do this? She hates icing. Oh, now I see. It's the "perfect" love from her sibling. My mom loves it. I think it is OK.
...Tonight. Last night my mom and my brother fell asleep right after dinner. I guess the soccer tournament weekend wore them out. So what did I do? I watched 7th Heaven and Gilmour Girls DVD's all night. When I woke up this morning and went downstairs this is what I saw. Lots of Dresses. 10 to be exact. I really do not like dresses so much. They are itchy. And I have to sit with my legs crossed like a lady. Oh and I HATE pantyhose. I do like some of these. I will have to have a fashion show for my dad later tonight. He likes it when I model clothes. A MESSAGE FROM MOM: Over the years it has become progressively more difficult to find clothes for Sarah, especially dresses. As her body has matured, she has put on weight around the stomach and hips but her arms and torso have remained extremely short. A few years back I discovered that girls dresses in size 14.5 or 16.5 work well. The half size gives the extra room for the waist and hip expansion, yet the sleeve length and the bodice length are still designed for girls, so they are shorter. The hem length is much better too, as Sarah has maxed out at 4'10." The only problem is finding those half sizes. Each season Dillards usually gets a few styles of party dresses in half size. Sometimes they are just too little girl looking, but we usually find at least one. The most recent find she wore to the music program last week. So this weekend, I was in Akron(about one hour south of where we live) for a soccer tournament with Matthew. They progressed on to the semi finals, with a few hour delay between games. So I headed down the street to a mall with a Dillards. I first sought out the restroom which they had located in the children's department. As I am walking through, I spot several racks of dresses with a 70% off sign on top. Hmm...it's worth a check a suppose. Holy cow. I found the above 10 dresses all in either 14.5 or 16.5. The best part: they were all marked down to either $10.80 or $15.00. Can you believe that!!!!! Now we will have to see if any fit and they can't be too scratchy. I better put this part in for Matt: His soccer team went on to win the semi-finals and the FINALS!!! They beat teams from Indiana, Columbus and two premier teams to take home the gold - well in this case a large crystal soccer ball trophy and "Champions" gray t-shirts. ...do real MEN use PINK...pellets??? Hmmm, maybe we jumped to conclusions assuming it was guys doing the dirty work. My dad got out the good old 409 and now my mom is hosing it down with hot water. What a mess. I just watch from the window. My mom said it was not a very good job, she would have done better in her time. Mom, I'm shocked. Then came the FU on the car window. Done with can cheese. Hmmmm... expensive, but not a bad choice. I think is when my mom let out her own F.U. Magenta paint balls on the white garage door. NOT COOL. 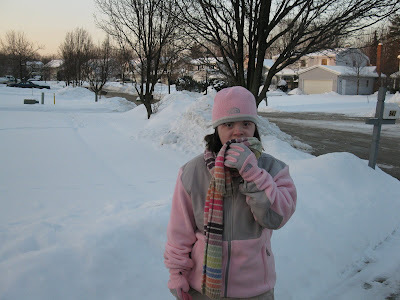 Don't forget we live in Ohio, the temperature outside is 16 degrees today. So now it is frozen. Oh great, it is also on the gutter. My dad was not too happy either. Actully, he called the police to come write up a report. Crime is not a typical way of life in our neighboorhood, so the officer was probably glad to have some humor on a Sunday morning. Stay tuned for the clean up. I'm just hoping I don't have to help. Note to pranksters...Hey, my mom wants to know why you didn't just use eggs? That's what kids used to use. Mom!!! How do you know that? 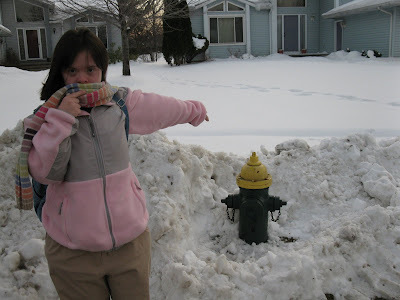 ...when I had to tell the driver of the tractor there was a fire hydrant buried under that pile behind me? Well, look what a great job they did. Thank you Mr. Tractor driver.